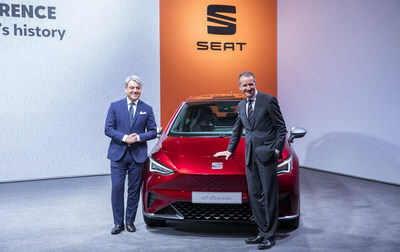 MARTORELL, Spain, March 27, 2019 /PRNewswire/ -- SEAT presented its electric strategy today which, until the beginning of 2021, will include six electric and plug-in hybrid models. The electric version of the Mii and el-Born will be the brand's first two fully electric models, while the new generation Leon and the Tarraco will feature a plug-in hybrid version. Furthermore, the CUPRA Leon and the CUPRA Formentor will also have a plug-in hybrid variant. SEAT President Luca de Meo also announced today at the company's annual media conference that the CUPRA Formentor, the new CUV that was unveiled at the Geneva Motor Show, will be built at the Martorell factory. During the presentation of the results held at SEAT's corporate headquarters in Martorell, company CEO Luca de Meo stated that "SEAT now has a clearer role in the Volkswagen Group, and thanks to the results obtained, we have earned the new electric vehicle platform." "For the first time, the SEAT Technical Centre will be developing a platform that may be used by more brands around the globe," added de Meo. Volkswagen AG CEO Dr. Herbert Diess attended the presentation and emphasised SEAT's role within the Volkswagen Group: "SEAT is playing a new role within the Volkswagen Group taking on even more responsibility. This year's achievements underline SEAT's potential to make use of growth opportunities and open new markets." Dr. Diess added that "The small electric platform project is a great step towards an even more affordable electric mobility. SEAT will realize the first electric vehicle that is especially designed for urban journeys." In 2018 SEAT obtained the best results in its history. Profit after tax went up to 294 million euros, 4.6% more than the previous year (281). Moreover, operating profit grew by 93.2% to stand at 223 million euros (2017: 116) and turnover amounted to 9.991 billion euros, which is 4.6% higher than the 2017 result (9.552). All amounts set new historic records. In the past five years, SEAT's turnover has grown by 33%. 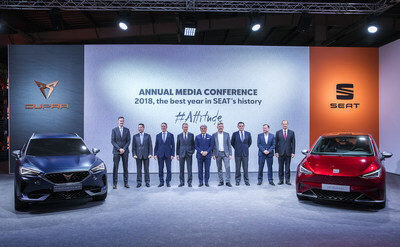 In addition, deliveries increased to the highest level in SEAT's nearly seven decades of existence, and the figure of 517,600 vehicles sold (10.5% more than in 2017), made SEAT the fastest growing brand in Europe last year. Boosted by the Ateca and the Arona, selling models with a greater contribution margin helped the improvement of SEAT's profit results. In its first year as an independent brand, CUPRA was instrumental in increasing the company's bottom line after sales went up by 40% to reach 14,400 units. According to Luca de Meo, "2018 was the best year in the history of SEAT. For the first time we have good products in the relevant and most profitable segments, which has led us to become one of the fastest growing brands in Europe in the past three years. The SUV offensive we began in 2016 exceeded our most optimistic expectations and one out of every three cars sold last year entered in this category. SEAT can now look the future straight in the eyes." Vice-president for Finance, IT and Organisation Holger Kintscher pointed out that, "As SEAT stands today, it is a financially sound, sustainable company. We have a thorough cost-efficiency programme and the resources to face the technological transformation of the automotive industry. We need that to stay profitable in the future." In 2018, SEAT exported 80% of its production output and consolidated itself as Spain's largest industrial exporter, with close to 3% of the country's total export figure. The goal for forthcoming years is to step up the company's globalisation. In this sense, it is rolling out an ambitious growth strategy in North Africa, where it will lead the Volkswagen Group's vehicle assembly project in Algeria and aims to increase its presence in the region in the medium term. Latin America is another potential territory for the brand to expand in, and there are plans to begin operations in Chile in the second half of 2019 and strengthen its presence in Colombia. In China, SEAT is a part of the JAC Volkswagen joint venture and preparations are being made for its entry in the world's largest car market.